With the North Korean news in the rear-view mirror and the Fed meeting ahead, the stock market rallied slightly on Tuesday. The Russell 2000 was up 0.46% and the Nasdaq was up 0.57%. The S&P 500 was up 0.17% which brought it to 2,786.85. That is less than 1 point higher than the March closing high. The next stop is the all-time high, which is only 3.1% away from Tuesday’s close. The CNN Fear & Greed index is still at 65 which signals greed. I think it’s good news to see most of the oscillators and sentiment indexes not reaching extreme levels yet. The dollar was up 0.23% which is worrisome as it looks to take out its May 29th high and stay in an uptrend. The most disconcerting aspect I’m focused on is the recent flattening of the curve as the 2 year is just 5 basis points away from its cycle high and the 10 year is 15 basis points off its high, meaning the difference between the two yields is 42 basis points. A hawkish Fed can invert the curve by the end of the year. With the stock market regaining its momentum, making it look like the volatility earlier this year was a correction instead of the start of a bear market, it’s easy to ignore the potential negative catalysts. It’s always necessary to counteract your viewpoint even if you are very confident it will be correct. Some people look at historical lists of the top risk facing the market and think the participants were wrong. If you’re asked to name a top risk, that doesn’t mean you think it will occur. It always makes sense to be aware of risks facing this bull market. In the next bear market, I’ll say the same thing about looking for positive catalysts. There clearly is a bias to the upside as American stocks have always increased. I looked at the first 4 topics in the checklist above in a previous article. The 5th topic is the market outperformed the economy and now the economy is outperforming the market. I don’t think this topic makes much sense because the previous one claims PMIs are falling. How can the economy be outperforming if is slowing? This bullet has a high amount of recency bias because in March and April we saw Q2 GDP growth in America was going to be strong, yet the stock market couldn’t form a rally. It’s easy to see this is faulty reasoning now that stocks have done well in the past few weeks. In my opinion, if you see the economy doing well and earnings growing, don’t try to come up with a reason the market is down. Sometimes the market has it wrong and stocks should be bought. Always thinking the market is efficient can cause you to miss out on gains. It sometimes is very easy to make money. When you see the pitcher throw a fastball right down the middle of the plate, don’t analyze the psychology of the pitcher; swing at the pitch! This is why I said to buy stocks at the low end of this trading range. The 6th topic is about risk parity trading going from doing well to failing. There are always stories about how risk parity is doing poorly because it is one of the new trends on Wall Street. However, risk parity isn’t a strategy employed by every investor in the same manner. It also only has less than $175 billion in assets under management, so I don’t think if a few fund managers fail at it, that it will cause the market to crash. Every time there’s a new strategy doing well, the financial media acts as if it will be the next mortgage backed securities which caused the market to crash in 2008. I’m not exactly sure what the 7th point means when it says government bonds are diversifying poorly. Either it means all government bonds have become correlated or government bonds have become correlated with stocks. There are situations where bonds and stocks fall, but that’s an observation of near term action rather than a new trend. The 8th point is fixed income no longer has momentum. The point about fixed income being expensive is correct. 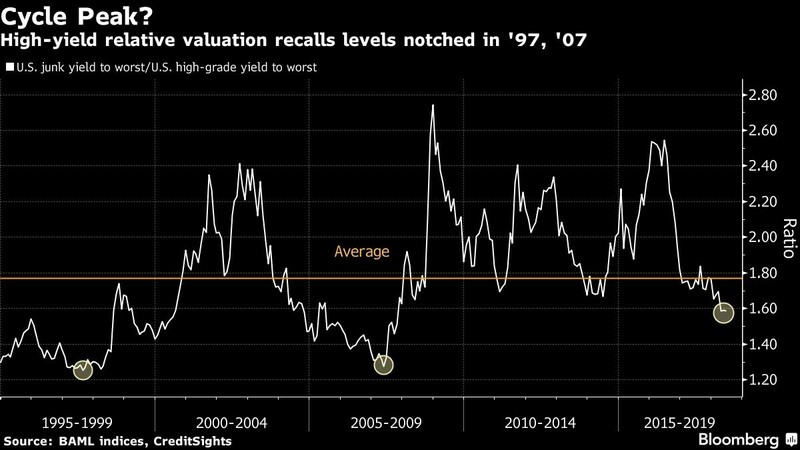 The chart below shows the high yield relative valuations are more expensive than average. The peak valuation was more expensive in the previous two cycles, so there might be more room to run. The worry is financial conditions start to become more stressed with the Fed rate hikes, causing junk bonds to fall. 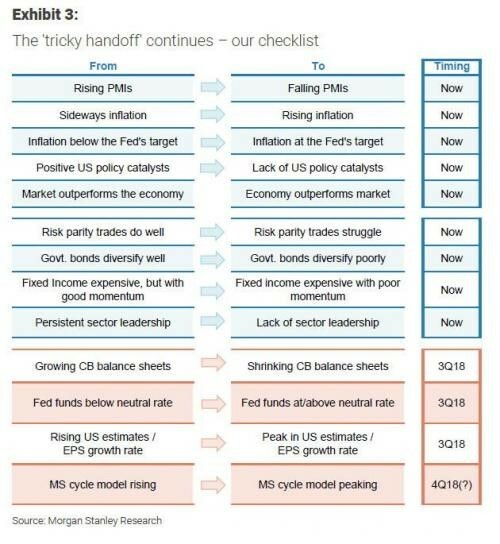 However, if you think this cycle has only relied on speculative momentum, you are wrong. The fundamentals have catalyzed asset appreciation. There needs to be a turn in the fundamentals for the momentum to reverse. The 9th point on this checklist is the last point which is said to be occurring now. It claims that the sector leadership is gone. This is old news. Two months ago, the leadership was gone, but now the FANG stocks are doing well, and the tech sector is within one percent of its all-time high. The market isn’t lacking leadership. Now it is lacking follow through from the lagging sectors such as the financials and consumer staples. The financials are still 7.36% off their all-time high and just 4.21% above their correction trough. The consumer staples have actually shown some signs of life in the past few days. Since May 2nd, the sector is up 4.73%. The stock market’s ability to reach a new all-time high this week will depend on the Fed’s guidance for the rest of 2018. I’m expecting the Fed to maintain the course since nothing surprising has been reported in the past few weeks which would make them change policy. Currently, there’s about an equal chance of 3 and 4 hikes. Either choice would probably be fine, but the bulls would rather 3 hikes to keep the Goldilocks situation alive.